I didn't think it could (or would) happen, but someone in Germany has turned dugout canoes into a modern business. A company called "Morokoro," which they say is a common word for the dugout in Africa, imports dugouts from Mozambique, selling and renting them in Germany. The trees used for the construction of our mokoros are not derived from ruinous exploitation but from dead or diseased trees. The tree trunk in its entirety is carved out with a hatchet. It takes two men ten days to complete this work. A 2.50 m long morokoro weighs approximately 30 kg. Thanks to the materials and techniques used, the mokoros, when normally used, are virtually indestructible. While the "virtually indestructible" bit is hard to swallow, the weight is reasonable and I admire the sustainable nature of their production. Boats start at 2,900 Euros, and rentals are 7 Euros/hour. There's a huge photo gallery that's intriguing to explore, but unfortunately no captions or any information about the photos. A few weeks ago I posted a link to a radio interview with Maine guide Randy Spencer, author of Where Cool Waters Flow. I just discovered his website, on which he offers not only guiding services, but also his book, CDs of his own music, voice talent for advertisements and such. And he maintains a blog with interesting observations on guiding, fishing, canoeing, the woods, and life in general. A couple posts back, I commented on By Canoe and Dog Train Among the Cree and Salteaux Indians, by Rev. 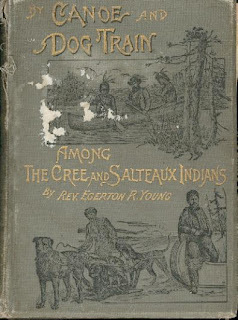 Egerton R. Young, saying that there wasn't much on canoe technique in what was mainly a memoir of a missionary in the wilds of Canada during the mid- to late nineteenth century. But in taking another look through the book prior to returning it to my Canadian friend, I came across a couple of interesting items. On one of these early trips we came to a place where for many miles the moving ice fields stretched out before us. One narrow channel of open water only was before us. Anxious to get on, we dashed into it, and rapidly paddled ourselves along. I had two experienced Indians, and so had no fear, but expected some novel adventures – and had them with interest. Our hopes were that the wind would widen the channel, and thus let us into open water. But, to our disappointment, when we had got along a mile or so in this narrow open space, we found the ice was quietly but surely closing in upon us. As it was from four to six feet thick, and of vast extent, there was power enough in it to crush a good-sized ship; so it seemed that our frail birch-bark canoe would have but a poor chance. I saw there was a reasonable possibility that when the crash came we could spring on to the floating ice. But what should we do then? was the question, with canoe destroyed and us on floating ice far from land. However, as my Indians kept perfectly cool, I said nothing, but paddled away and watched for the development of events. Nearer and nearer came the ice; soon our channel was not fifty feet wide. Already behind us the floes had met, and we could hear the ice grinding and breaking as the enormous masses met in opposite directions. Now it was only about twenty feet from side to side. Still the men paddled on, and I kept paddling in unison with them. When the ice was so close that we could easily touch it on either side with our paddles, one of the Indians quietly said, "Missionary, will you please give me your paddle?" I quickly handed it to him, then he immediately thrust it with his own into the water, holding down the ends of them so low horizontally under the canoe that the blade end was out of the water on the other side of the boat. The other Indian held his paddle in the same position, although from the other side of the canoe. Almost immediately after the ice crowded in upon us. But as the points of the paddles were higher than the ice, of course they rested upon it for an instant. This was what my cool-headed clever men wanted. They had a fulcrum for their paddles, and so they pulled carefully on the handle ends of them, and the canoe sliding up as the ice closed in and met with a crash under us, we found ourselves seated in it on top of the ice. The craft, although only a frail birch-bark canoe, was not in the least injured. Good story, perhaps, but I don't buy it. If you're sitting in the canoe, you can't lift it by pulling up against the bottom of the canoe itself, even if you DO have a lever -- or at least it seems that way to this physics drop-out. (I'm thinking about the old saw "just give me a long enough lever and a place to stand, and I can move the Earth." Well, that assumes that the place you're going to stand isn't ON the Earth.) Was the good reverend mistaken about what went on here, or is he telling a whopper? Ever on the look-out for improvements to aid him in more rapid transit through the country, Mr. Evans constructed a canoe out of sheet tin. This the Indians called the "Island of light," on account of its flashing back the sun's rays as it glided along propelled by the strong paddles in the hands of the well trained crew. With them they carried in this novel craft solder and soldering-iron, and when they had the misfortune to run upon a rock they went ashore and quickly repaired the injured place. Could this have been the first metal canoe, 100 years or so before Grumman? In any case, it reminds me of Rob White's How to Build a Tin Canoe: Confessions of an Old Salt . Now, this may be a bit off-topic, but Rob White was, IMO, the best humorist and one of the best philosophers to ever write about boats and boating. And while most of the essays in this book aren't about canoes (or any other indigenous boat, per se), it is a real gem that I recommend wholeheartedly to anyone who loves boats, the water, and the whole "messing about" ethos (even if you, like I, are tired unto death of the whole "messing about" cliche itself). 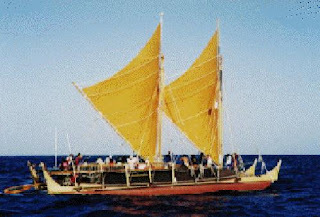 Hokule'a is without a doubt the most famous Hawaiian double canoe in existence. After a rough start beset by political and personal conflicts that nearly wrecked the project, she has gone on to complete many impressive voyages, the last one in 2007. Owned by the Polynesian Voyaging Society (PVS), she serves as an icon of native Hawaiin culture and a training platform for teaching traditional navigation and seamanship. Finney and his early partners founded the Polynesian Voyaging Society to help organize and fund the project but, according to Finney, the organization and the project were hijacked by nativist Hawaiians who wanted to use the canoe to promote Hawaiian cultural identity. Finney felt that the two objectives were almost entirely incompatible, and his book concentrates mostly on the resulting conflicts. (He acknowledges, however, that his narrative is quite one-sided.) The book is a tale of a terribly-managed project that just barely managed to fulfill its original goals in the face of tremendous personnel problems. Along with insubordination, there were fistfights and threats of mutiny. Somehow, the Polynesian Voyaging Society turned the situation around later, and Hokule'a has clocked more than 32,000 sea miles on a half a dozen voyages, visiting most areas of the Pacific, mostly on cultural missions. (A circumnavigation is apparently in the planning stages!) Finney's name is hard to find in any context on the PVS website: he doesn't appear to be currently associated with the PVS, and it wouldn't surprise me if he dropped out immediately following the first awful voyage and has been placed under a taboo by the organization. PVS seems to be almost exclusively concerned with using the boat as a way to champion cultural identify -- there is very little about serious science on their website. The boat itself is unusual and impressive. The PVS calls her a "performance-accurate" replica, meaning that she is believed to perform like the traditional boats she resembles. Construction-wise, however, she's quite different. The hulls are cold-molded, with several intermediate bulkheads, rather than carved from single huge trunks. (PVS has subsequently built another canoe, Hawai'iloa, from huge Alaskan cedars -- about as close to the original construction as is possible at this time, since Hawaiian koa logs of the necessary size are no longer obtainable.) Steering is done with steering oars, which do not pivot side to side; direction is controlled by simply lowering the oars into the water or raising them out of it. With an LOA of 62'4" and beam of 17'6", she is much narrower than a modern catamaran of the same length but in keeping with the traditional configuration, which was narrow "due primarily to the limited ability of the wooden cross-pieces and coconut fiber lashing to withstand the phenomenal stress the ocean imposes on a widetrack double-hull craft," according to Tommy Holmes in The Hawaiian Canoe . Her original rig was a very modest 540 square feet of sail area on two crab-claw (spritsail) masts, which gives her performance on the order of 3 or 4 knots upwind, and 5 or 6 downwind . She is capable of tacking to within 70 or 75 degrees of the wind -- comparable to the pointing ability of square-rigged ships -- which, based on the results of the first voyage, from Hawaii to Tahiti, was sufficient to have allowed double canoes to have indeed colonized Polynesia in an intentional effort of exploration and settlement. Caveat: I'm addressing these two old canoeing books in a single post not because they're thematically similar, but because they're both of a comparable age, and because both were loaned to me by the same individual and I want to return them together. 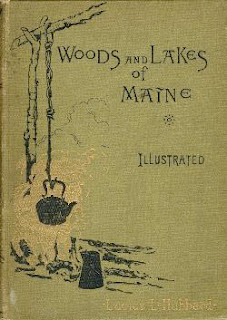 Woods and Lakes of Maine, by Lucius L. Hubbard (1884, James R. Osgood & Co., Boston), has the lengthy subtitle "A Trip from Moosehead Lake to New Brunswick in a Birch-Bark Canoe to which are added Some Indian Place-Names and their Meanings." Hubbard's trip, conducted in 1881, was for purely recreational purposes. It involved one friend, and two Indian guides, and two canoes: one bark, one cedar/canvas. "Lucius Hubbard’s book stands loftily above other Maine examples of the backwoods travelogue. The observant Hubbard and his party carried from the Allagash Lakes to the Musquacook Lakes, then down the Musquacook Stream and back into the Allagash, an impressive trip. Even more than Thoreau, Hubbard is an engaged participant in his story. He paddles. He works up a sweat on the portages. A good read and highly recommended." Although Hubbard likes his Indian guides and admires their backwoods skills, there's a certain condescension in his descriptions of their characters. That condescension, though, was probably far less toxic than the attitudes of many of his contemporaries. If we can avoid viewing our forebears with today's attitudes, I think we can accept Hubbard's attitude toward other races as being sincerely well-intentioned. 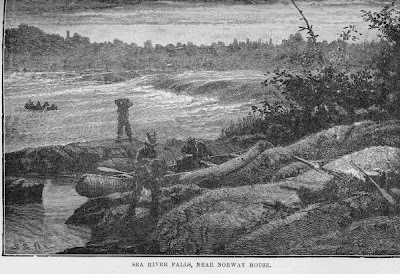 There are many good, detailed descriptions of the outdoors, woodcraft, and paddling throughout the book, especially a fine description of how to make up a portage pack out of a canvas tent. Other detailed explanations include how to portage a canoe; how to call a moose; and how to pole up rapids; and he devotes much space to a discussion of the beaver's domestic arrangements. His friend, "the Captain," provides comic relief in his frequent complaints about weather, mosquitos, and hard work in general. Hubbard should be read with a large-scale map in hand, for most place-names haven't changed much, and one can follow his party's every move from Moosehead Lake to the St. John River. 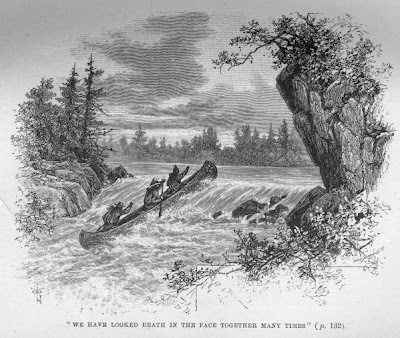 The first shows an accurately rendered Cree canoe, by an illustrator who clearly had good source material to work from. The next one, unintentionally comical, is captioned "We have looked death in the face together many times," but the page referenced makes no mention of the bizarre scene depicted. I can't figure out if the canoe is miraculously ascending the waterfall, or if it's being unaccountably swept down it stern-first from the apparently calm lake above. Either way, this illustration betrays the illustrator's lack of understanding of his subject matter -- a marked contrast to the excellent rendering immediately above. "We have looked death in the face together many times"
The Beothuk Indians of Newfoundland were completely exterminated by the early 19th century by a combination of direct, conscious oppression by European settlers (and, to an extent, by Micmac people in Newfoundland) and by diseases unwittingly brought to them by Europeans. Because the Beothuk attempted, in the majority of cases, to avoid all contact, including trade, with Europeans, little is known of them. They did build quite distinctive birch bark canoes, of which certain details are known. Others, however, will probably remain forever mysteries. Beothuk canoes were from 15' to 20' long, and almost a pure V-shape in cross-section throughout their entire length, with just a bit of rounding off of the apex. They had dramatic sheer both fore and aft, and amidships the gunwales rose in an even more dramatic hump, a feature that I'll discuss below. The boats were amazingly deep (for canoes) between the humped gunwales (or "wings"), which were held apart by a particularly long thwart. With their V-bottom, the canoes would have been extraordinarily unstable were it not for another unique aspect of the Beothuk design: they relied on interior ballast, in the form of stones. These were covered by battens and moss, skins, or some other soft material for the comfort of the paddlers. With their stone ballast, they would have been quite stable in their intended use, which was coastal and even offshore waters. The Beothuk took their canoes as much as 40 miles offshore to collect birds and eggs from smaller islands -- further than any other bark canoes used by Native Americans. They were not used for inland waters. It may be presumed that they were also used to hunt sea mammals, as the Micmac did in their "rough water" canoes, which also had a humped gunwale (although not nearly so dramatic). In both cases, the raised gunwale amidships would have helped keep out water in rough conditions, while the lower sheer fore and aft of amidships provided clearance for the crew to wield their paddles. The Beothuk's V-bottom and great flare would have given the boat tremendous secondary stability (much like a Banks dory), which would have come in handly when hoisting a captured seal or porpoise over the side. 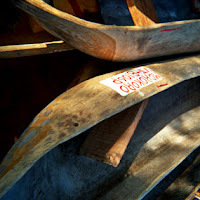 Beothuk canoes were unique among North American bark canoes in having a backbone. Not a keel, but a keelson, laid inside the bark covering and below the ribs, provided longitudinal strength. Most other construction details followed standard American Indian practice, with the possible exception of the gunwales, more on which below. Like other bark canoes, they had sheathing against the inside of the bark, held in place by bent ribs, and were lashed together with split spruce roots. As cedar was unavailable in Newfoundland, spruce took its place for the sheathing and ribs. There is some disagreement about whether the bottom was deeply rockered or straight. 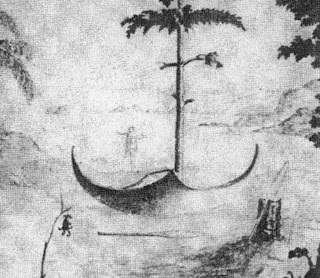 A sketch from 1768 (below) shows the rockered interpretation, and the artist described the boat as being like a "half moon" in profile, "nearly, if not exactly, the half of an ellipse." Three grave models have been found, however, which show a straight bottom with a distinct break where the ends rise from it, and the last surviving Beothuk, a woman named Shanawdithit, made a model in 1826-27 (shown below) that also had these attributes. Although boat models made by indigenous people are often inaccurate, I'd say the straight bottom seems more likely. Another design feature about which there is some disagreement is the shape of the gunwales. The grave models referred to above had the gunwales rising to a smooth curved hump amidships. 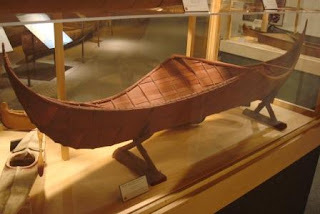 Shanawdithit's model, in contrast, shows the gunwales rising to a point amidships, as does another model held by the Royal Scottish Museum which, according to Kenneth G. Roberts and Philip Shackleton in The Canoe, was also of Beothuk origin. This is further supported by the 1768 sketch above, and by the accompanying description that noted the sharp angle and stated that the gunwales were formed of two pieces joined in the middle. One more bit of support appears in a very bare description dating to 1612 that compared the Beothuk canoe to the wherries of the Thames River in England. Although this description doesn't refer specifically to the sheerline or the gunwales, the "broken" sheer of the Thames wherries is perhaps their most obvious visual characteristic. 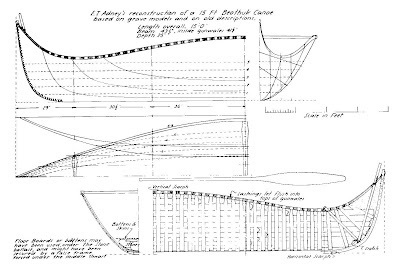 Adney concluded that the humped version was the correct one (see image below), saying of the "broken" interpretation: "This hardly seems corrrect since such a connection would not produce the rigidity that such structural parts require, given the methods used by Indians to build bark canoes." He speculates that the 1768 observer saw a damaged canoe, in which the humped gunwales had been broken, creating the sharply pointed sheer. I cautiously disagree with Adney's conclusion. He seems to be ignoring the unique construction feature of the keelson which, I believe, would impart the necessary longitudinal rigidity to the structure, reducing or eliminating the stress on the gunwales which, in other bark canoes, provide the majority of longitudinal strength. The preponderance of evidence, I believe, points to the pointed gunwales. One more interesting feature to note in Adney's reconstruction is the nearly vertical post extending above the stems at both ends. This was used, he says, to raise the ends when the boat was inverted on the ground for use as a shelter. Raising the ends would have been necessary, even with their extreme rise, because of the equally extreme rise of the sheer amidships.